The U.S. Army has brought members of the Tunisian Air Force to Roswell for aircraft training. The Army program provides training and equipment to foreign militaries so they can better protect and provide security within their own countries, while also becoming better prepared to work jointly with the U.S. military if necessary. Tunisia is a U.S. ally located on Africa’s northern coast. 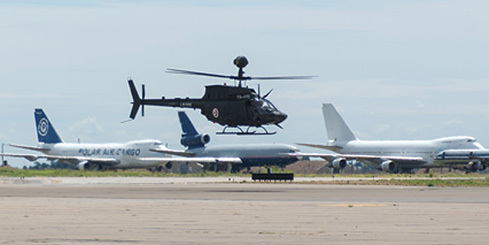 Equipment for the training operations, which involve a private company contracted by the Army, began to arrive at the Roswell International Air Center (RIAC) the first week of August. The first group of Tunisian Air Force pilots and aircraft maintenance personnel arrived the following week. More than 70 pilots and flight crew are scheduled to rotate in and out of Roswell during the six months the training is taking place at RIAC. With its long runway, relatively low air traffic, and good weather, including often clear skies, RIAC has earned recognition as a favorable site for military aviation training. In recent years, U.S. military pilots have trained in the skies over southeast New Mexico, establishing a training base at RIAC for two months or more each year. In addition, commercial airline manufacturers have used RIAC as a testing site for new planes. The training in Roswell was initiated by the U.S. Army Security Assistance Training Management Organization (SATMO), which operates under the Army Security Assistance Command. The Tunisian Air Force members are training on OH58D Kiowa helicopters. With its motto of “Training the World, One Soldier at a Time,” SATMO soldiers and its contractors carry out security-assistance missions worldwide, recommend security-assistance training to U.S. diplomatic missions, build the roster of the United States’ “partner nations” and strengthen those U.S. global partnerships. SATMO missions abroad promote regional stability, deter aggression, maintain alliances and spread democratic values between the United States and its allies, explains Adriane Elliot, a public affairs specialist with the Army Security Assistance Command. Training – such as that taking place in Roswell now through January – is tailored to the specific needs of partner nations to create inter-operability with the U.S. military. Elliot notes as partner nations increase their capabilities to defend themselves, it reduces the number of personnel the United States has to deploy when providing military aid to allies. “We appreciate the patience and support of the Roswell community as we conduct this critical mission,” Elliot said. More information about the Army Security Assistance Command and the Security Assistance Training Management Organization can be found at www.army.mil/info/organization/usasac.